This past week my 4th graders have been working on some radial printmaking. To begin the project, we started by reviewing a PowerPoint which goes over the three basic types of symmetry; linear or bilateral symmetry, radial symmetry, and asymmetry. 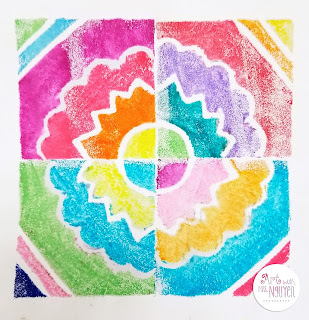 In the beginning of the year my 4th graders made mandalas, so they were already very familiar with radial symmetry and design. After the PowerPoint I gave each of my students a half-sheet of grid paper with a few 2”x2” squares blocked out (the same size as the stamp). I explained that students would be creating a stamp, that when rotated around its access and stamped 4 times, would create a radial symmetric design. Because the stamp would be rotated, it was important that lines that started at a particular side ended at the same position on the adjacent side. So for example if I drew a line that started at the first mark on the y-axis, it would need to end at the first mark on the x-axis. Students were asked to create a few different design ideas and then pick their favorite from the ones they drew. After selecting their final design, students transferred their design onto a piece of 2”x2” Styrofoam with a dull pencil. It’s imperative that the pencil is dull so that the Styrofoam doesn’t tear. For the first half of the project students used this stamp to create radial prints with a brayer and black ink. Once they were done, they moved onto the second half of the project – marker prints! Students cleaned their stamps the best that they could, then used washable markers and colored their stamps. After that they took a damp sponge and wiped it across their paper. It’s important that the paper is damp enough to wet the marker ink, but not wet. If the paper is too wet it will start to warp, tear, and the marker ink will soak in and look messy. 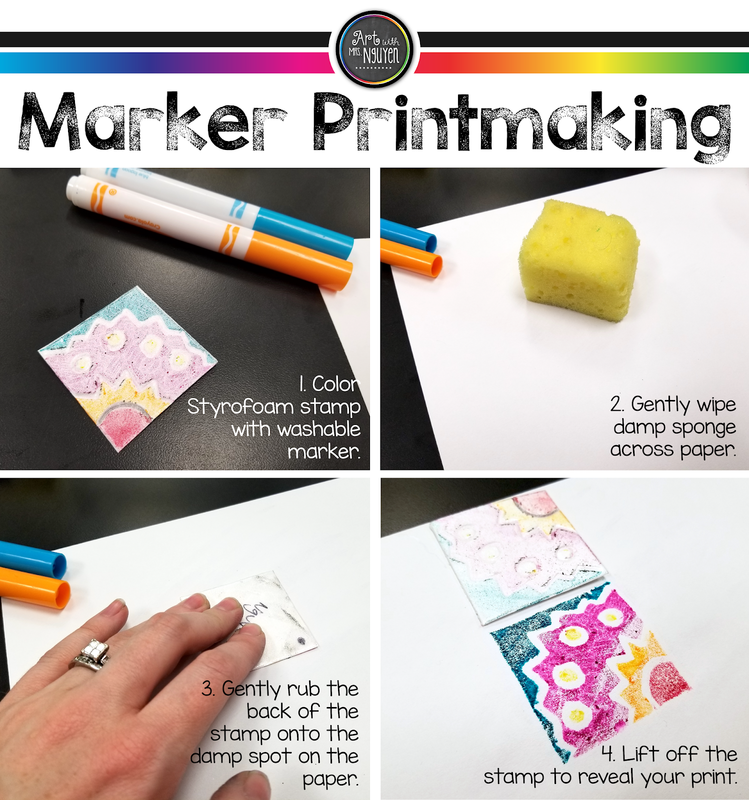 So after the paper was wiped with a sponge, students gently placed their stamp onto their paper and then gently rubbed the back of their stamp to transfer the image. Once they stamped their image once, they re-colored their stamp, rotated it 90 degrees, wiped their paper with the sponge, and then stamped again. After 4 rotations they got their radial symmetric design! While many of my students were able to do this successfully, there were still quite a few that had trouble. I’ve compiled a list of tips that should help. 1. Make sure that students wipe the paper with the sponge just enough to make it damp - not wet. 2. Do not wipe multiple times in the same spot or the paper will start to pill. 3. Make sure that the markers they are using are not dried out. 4. When students lay their stamp down to make a print, make sure that they use their finger to gently (but firmly) rub over the entire design. They should use the fingerprint part of their finger, not the tip or nail. It takes me about 10 seconds to fully press down and rub the back of my stamp. I absolutely love how these turned out and the kids really enjoyed the colorful lesson extension!